My Atlantique Ascoli tops are in heavy rotation this summer—so much so that I may buy doubles since they are on sale for a fraction of what I paid two years ago. I love them because they are more feminine than a button-down, but not frilly with lace. My friend Amy, a fellow blouse connoisseur, is a fan of Merlette (and here) upper right. 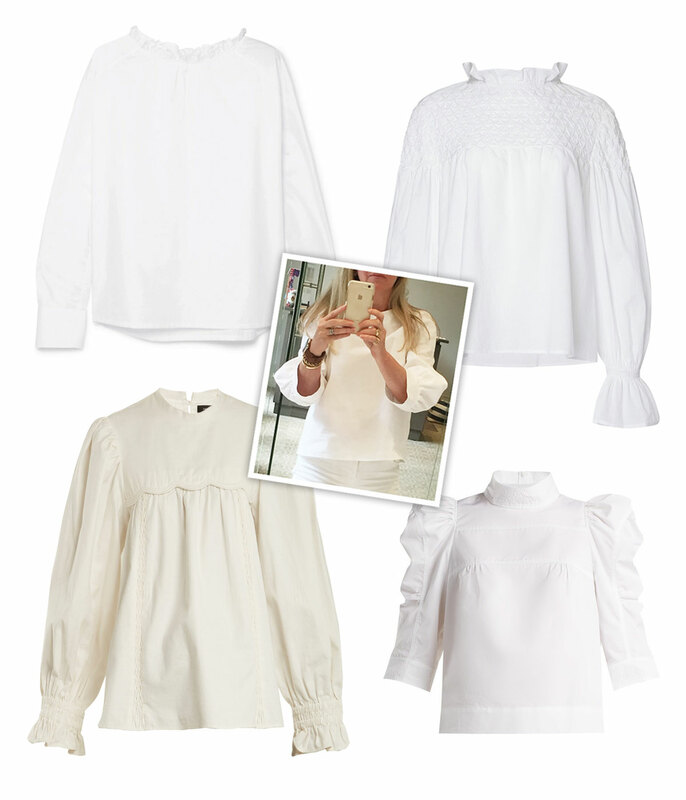 The Isabel Marant top bottom left (also on sale) caught my eye—the scalloping and gathered sleeves are nice details. Clockwise: Altlantique Ascoli and here, Merlette, Chloé, Isabel Marant. I love those blouses worn with white jeans,,, like you’ve shown. So easy and chic. Those tops are great! Thank you., Preston. What does everyone think of the white top & white bottom? Love all white….thanks for the tip just placed my order! I love wearing all white in the heat of the summer; sometimes tucked with brown leather or a beautiful cotton or silk scarf rolled and worn as a belt. My favorite white summer blouses with interesting details (pleats, tucks, full sleeve, lace, etc.) are Anne Fontaine, but their past few seasons have been weak. Thanks so much for the post, Preston. I ordered the AA top, price amazing! Thank you, Yasmin, for your kind words. I post what I like and I’m happy when readers like my picks, too. Hi Preston, could you respond to the sizing question? You have me hooked on Atlantique Ascoli. After your first post, prior to it being carried at a lot of places, the tops went on sale and I purchased 3 different styles in every color I could get my hands on. My sales person, Miguel at The Line in LA told me I am obsessed and he is right! Your eye is impeccable. Thank you! My friend Mary pushed me to buy an Ascoli top a few years ago, she deserves all the thanks. Thank you for the tip, Preston. I ordered several and hope some will work out. !